After destroying sunglasses, knives, and cheap watches, GearJunkie has me squaring off in not one, but two boss battles. I could practically hear the heavy metal music as I pulled the package from my mailbox. 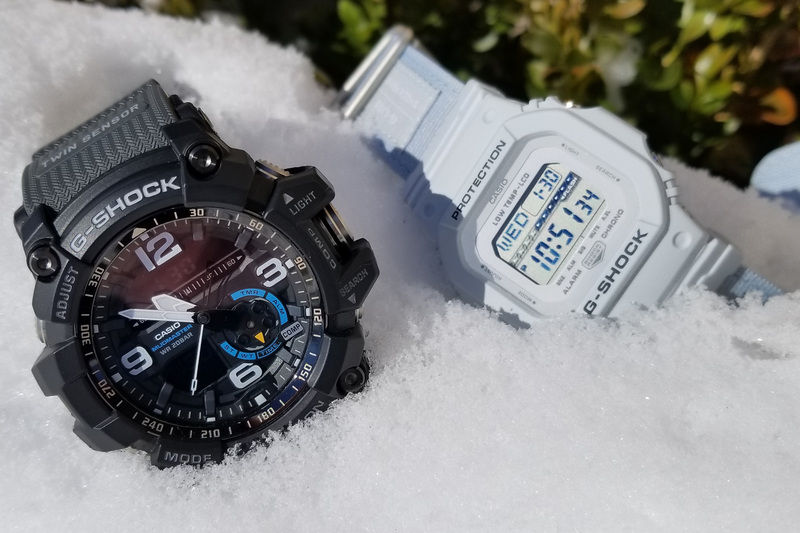 Inside were two timepieces from Casio’s legendary G-Shock line: the smooth G-Lide and the down-and-dirty Mudmaster. Both have Casio’s rugged, multifunctional quartz movements packed inside resin cases rated for 200 meters of water. But, if video games taught me anything, it’s that even final bosses have weaknesses. 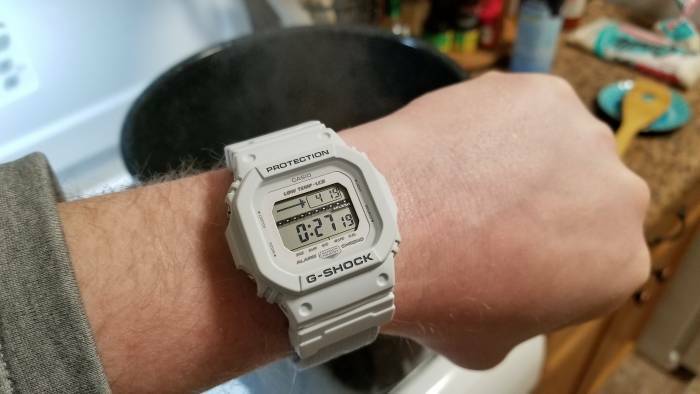 Let’s see if I can find the gap in the G-Shock armor. The first trial was simple. 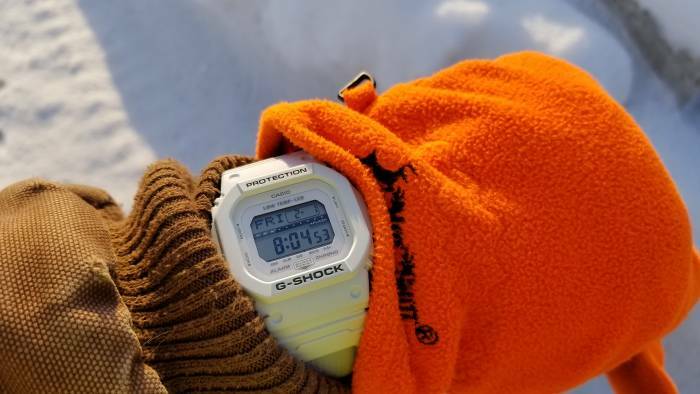 See that text on the G-Lide below? “Low Temp-LCD.” Well, it just so happened to be around -20 degrees Fahrenheit outside when the pair arrived. For the better part of an afternoon, into the snowbank they went. Despite this exposure beyond their rated limits (-4 degrees F), both survived this deep freeze without issue. I was impressed with their ability to remain legible even in extreme temperatures. 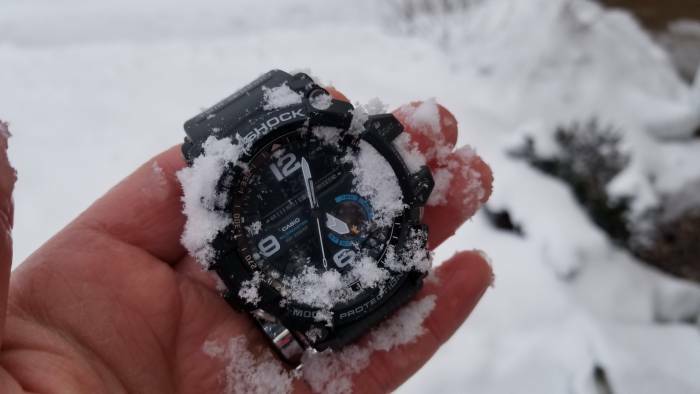 There’s another bit of irresistible branding on the larger watch: “Mudmaster.” A few weeks after the cold snap, the spring rain and thaw made their way to my southern Wisconsin home. There are puddles aplenty in the field behind my garage. I spent several minutes strolling through this mud, with the Casios underfoot. Again, neither showed any signs of fatigue. At this point, both watches were in need of a good cleaning. Into the laundry room sink they went, while load after load of work clothes and towels ran through the washer. Thoroughly rinsed, I tossed the dripping timepieces into my freezer. Why did I do this when they’d already been frozen outside? Well, one thing you learn in winter construction work is the power of ice. If water gets inside pipes or equipment and freezes, it can expand and pop seals, crack gaskets, and wreak general havoc. 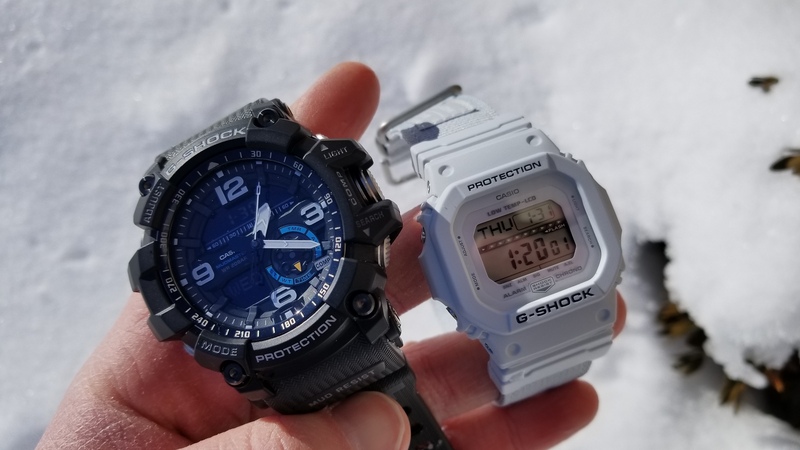 The idea was to see if water had crept into any part of the G-Shocks, which would have been noticeable when it turned to ice. Again, both emerged without a single blemish. So we know they’re tough. But let’s take a look the good and the bad of each of these variations on the G-Shock theme. The good: Beyond its established durability, the Mudmaster has an incredible feature set. In addition to the standard bevy of alarms and timekeeping options, there are a compass and a temperature sensor. You get redundant low-light visibility as well, with a backlight and illuminating compound applied to the hands and indices. It’s also a surprisingly legible watch given the amount of information displayed on the face. The buttons are large and easy to press, with multi-gasket construction to keep out the mud. The bad: Let’s start with the elephant on the wrist — this watch is huge. At over 55 mm, it’s far too large for my average-sized arm. It refuses to go quietly beneath a shirt or coat cuff, and it looks out of place with almost any outfit. It’s not the heaviest watch I’ve worn, but the sheer volume of the thing is monstrous. It was a bit of a chore to wear, especially given the lack of adjustability in the band. See those holes? They’re pretty far apart, making it difficult to dial in a sweet spot. This is a personal problem, so those with large forepaws should be less affected. My biggest issue is this: Why is Casio putting mineral glass on a watch that’s supposed to be the last word in toughness? This baffles me, especially at around $240. My Victorinox I.N.O.X. costs about the same and sports a beautiful sapphire crystal and solid steel case. No scratches popped up during my testing, but it’s something to consider for the long term. The good: This watch is surprisingly comfortable. Although the canvas band may seem like a strange choice for a heavy-duty watch, its robust fabric handled everything I threw at it. The watch itself is sized similarly to the classic F108W, so it’s eminently wearable. I’m not a big fan of the white-on-white coloration, but there are other shades out there, and I get it as an outdoor choice for winter. Just don’t drop it in the snow. The bad: As comfy as the band’s material may be, it lacks a bit of adjustability. Like the larger Mudmaster, the holes are fairly far apart. This means that, for my wrist size, it was always a bit too tight or too loose. The soft canvas band makes this easier, but it’s still hard to find the sweet spot. You’d think a watch with this sort of simple face would be easy to read at all angles, right? Well, no. For whatever reason, the low-temp LCD distorts easily if your wrist is cocked to the side. It’s not horrendous, but the basic F108WH is much more legible in daily wear. You also get mineral crystal here, but I’m not as concerned on a watch costing less than $100. I’m thoroughly impressed by the construction quality of both the Mudmaster and the G-Lide. While I have some qualms about their respective size and legibility, I feel these are both incredibly solid timepieces. I’d grab the G-Lide if I could have just one, but the Mudmaster is a great choice for those with large wrists and dirty jobs.